I've been saving this lager for a day just like today. Upon receiving a sixer of New Glarus beer back in March, I had a vision of enjoying this exact bottle of Two Women on a pleasant, hot June evening. Well, good news for me. The sun's shining. The birds are singing. And, damn, is it hot. Maybe it's the color of the label. Maybe it's that this beer is a craft lager. Whatever the reason is, the fact remains: I saved this bottle for a day exactly like today. The question is, was I right to do so? Anyone who's been reading this blog for the last few months will know the deal with New Glarus Brewing Company. But, for those new to these parts, let me give you the rundown. The brewery is headed by a husband and wife team: Dan and Deborah Carey. Dan is a top-notch brewer who cut his teeth in a small German brewery. Deborah is a financial wizard who started the company as a present for Dan. The whole shebang can be found in New Glarus, Wisconsin. To learn more, be sure check out the brewery's "Brew Crew" webpage. Now, onto the beer at hand. According to this, its official page on New Glarus' website, Two Women is an old-time country lager crafted to honor brewers of old--who were traditionally women. It's a collaboration between New Glarus (a Wisconsin brewery) and Weyerman Malting (a Wisconsin maltery) (both of which happen to be headed by women). The lager, touted as crisp, satisfying, and well-balanced, is crafted with Bohemian malt and Hallertau Mittlefrueh hops (my palate is too unrefined to tell you what those malts and hops taste like but I'm including them here just in case one of you knows). Untappd says the brew is 5% ABV. 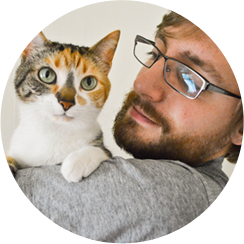 Before getting into what I think of the lager's aroma, let me tell you that Purrl loved it. Giving it eight whiffs, this is the first beer she's loved this much in a long time. I can see why. This smells exactly how you'd imagine a top-notch lager smells. With notes of rice and toast, and a mild graininess, Two Women has the best nose of any lager I've encountered. The word best is also how I'd describe the brew's flavor. It has that toast taste. It has that rice taste. It has a subtle maltiness that hangs in the back of my jaw and asks me to go in for another swig. I love it when aroma and flavor match perfectly like this. Kudos, New Glarus. There isn't much carbonation going on here. Mild at best. But that's fine. This is a smooth brew that, true to the brewery's word, is crisp and satisfying. Two Women, believe it or not, makes me think of "Ten Women" by Conor Oberst and the Mystic Valley Band. Yes the names are similar. That's obvious. And that's obviously part of the reason why this beer makes me think of that song. But it goes deeper than the names. You see, the summer before my first year of graduate school was one of the best summers of my life. Not because I worked at Kroger. That was actually the worst part of that summer. No, that summer was great because of the rightness of it. I was living with Michelle and our two cats in a supremely affordable apartment an eight minute drive from Strouds Run State Park. For those not familiar with that place, there's a beach there. I wouldn't say it's a particularly nice beach. The water's warm and brown (and sometimes mildewy) and the sand's hard and rough. But, it's a beach that we could get to easily from our apartment. And we went a ton. The only album we ever listened to on our short trips there was Conor Oberst and the MVB's Outer South, on which you can find "Ten Women." That album and that beach encapsulated that summer. Yeah, there were plenty of other great occurrences in that season. But that song, and now this beer, bring me right back to it. 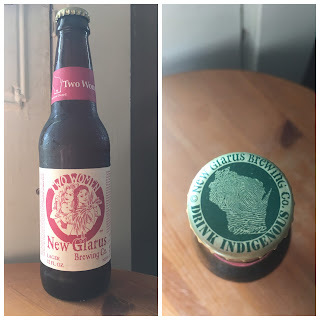 New Glarus' Two Women is now my favorite lager. It earns a 10/10 rating. Find it, try it, and love it. You won't be disappointed.